Dr. Edgard Espinoza is the Laboratory Deputy Director at the National Forensics Laboratory for the U.S. Fish & Wildlife Service, dedicated to the investigation of crimes against wildlife. 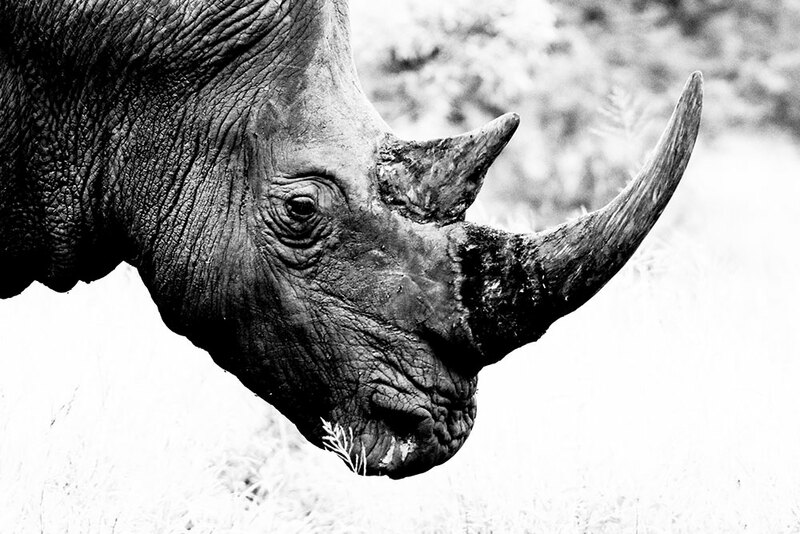 One area of investigation is in the enforcement of laws protecting rhinoceros. Dr. Espinoza was searching for a rapid method to quickly screen and characterize keratin found in horns based on taxonomy for banned or regulated items. The methodology of choice was Direct Analysis in Real Time coupled with Time-Of-Flight Mass Spectrometry (DART-TOFMS) due to the ability to quickly and directly analyze samples with minimal sample prep. Using DART-TOFMS, molecules on the surface of a sample are pyrolyzed at a given temperature, where the vapors are ionized and introduced into the Mass Spetrometer for analysis. However, it was unclear the optimal temperature at which to perform the analysis. “Too low a temperature and the molecule of interest might not be detected at all. Too high and the molecule could break up into fragments making analysis nearly impossible”, said Dr. Espinosa in a phone interview. Thus, the key to his research was to find a working temperature hot enough to pyrolyze a molecule of interest, yet still remain in tact. Dr. Espinoza took his research to the next step by using the ionRocket, which applied a heat gradient directly to the samples, for rapid and correct identification of the optimal temperature in which to introduce samples to the DART gas stream. Thus, he could move forward with his research and identify specific biomolecules based on taxonomic classification, which will help in the enforcement of laws to protect wildlife. BioChromato was at the Pittcon Conference and Expo, where we had analytical equipment on display, as well as our Smart Evaporator C10. In addition, we also had a poster presentation explaining our development of two innovative devices for DART-MS systems called ionRocket and Volatimeship. DART-MS is a powerful method for analysis of sample mixtures. However, this method is not suitable for polymer analysis because many polymers are difficult to volatilize. Thus, we developed the “ionRocket ” which induces thermal desorption and pyrolysis of samples. The vapor phase of polymer samples was generated by applying a temperature-controlled heating gradient, then ionized and introduced into the mass spectrometer. Although DART®-MS also detects volatile compounds, diffusion can make them undetectable in the open environment. In order to overcome this issue, we developed a closed-chamber interface device called “ Volatimeship ” combined with DART®-MS is an effective method to monitor volatile compounds with short analysis times and high sensitivity. 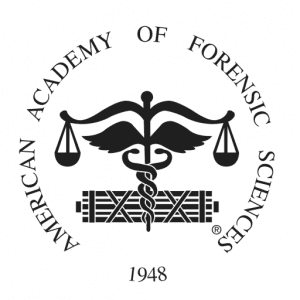 BioChromato had a poster session at the American Academy of Forensic Scientists in Seattle, Washington, where we presented the use of our ionRocket device in the forensic laboratory setting. The ionRocket is a thermal desorption and pyrolysis device for use with DART Mass Spectrometry. It’s a unique instrument that eliminates sample prep allowing direct analysis of samples by heating up to 600°C at a specific rate of heating. Data can be obtained using the ionRocket in minutes that is similar or complementary to pyrolysis with GC-MS, but in a fraction of the time. 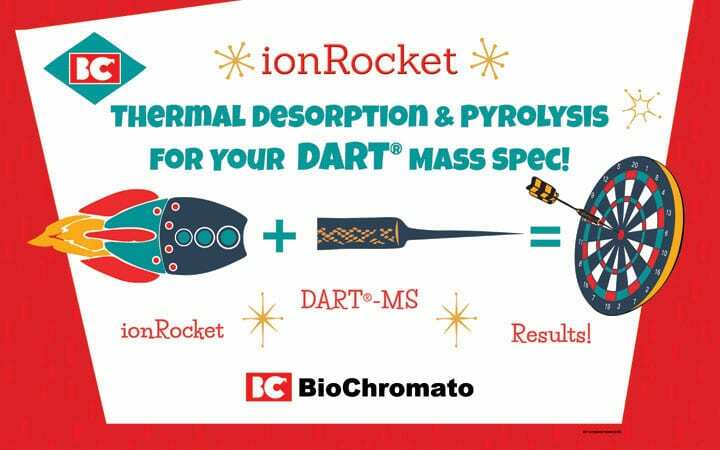 Thus, the ionRocket shows gaining strong support in the forensic science field, especially among those already familiar with DART-MS.
BioChromato visited the Mass Spectrometry Applications to the Clinical Lab (MSACL) meeting in Palm Springs. There, we met with researchers and manufacturers working in the field of mass spectrometry in the clinical setting. Researchers and companies in the field of toxicology were impressed with our self-closing plate seals called Slit Seal, for use with 96 well plates. They found our plate seal worked well with automated liquid handlers for LC-MS in drug screening and other applications. BioChromato attended the Gulf Coast Conference in Houston, TX. In addition to our booth, we were honored to be awarded Best New Analytical Instrument for our innovative pyrolysis device called ionRocket, where we had it on display at the New Product Showcase. The ionRocket is a thermal desorption and pyrolysis device for use with DART Mass Spectrometry. It’s a unique instrument that eliminates sample prep allowing direct analysis of samples by heating up to 600°C at a specific rate of heating. This separates compounds based on volatility thus providing resolved mass spectra similar to a chromatogram. BioChromato met with top leaders in the oil and gas industry like General Motors and Exxon Mobile. Customers in the oil and gas industry were impressed by the ability to analyze oil and other automotive fluids. They expressed particular interest in the ability to quickly analyze antioxidants and other additives in automotive oil and other fluids for quality control purposes. We also presented a poster on using our analytical device on lubricating oils. This analysis method enables detection additives and base oil in the lubricating oils respectively by gradient heating, without any pre-treatment. 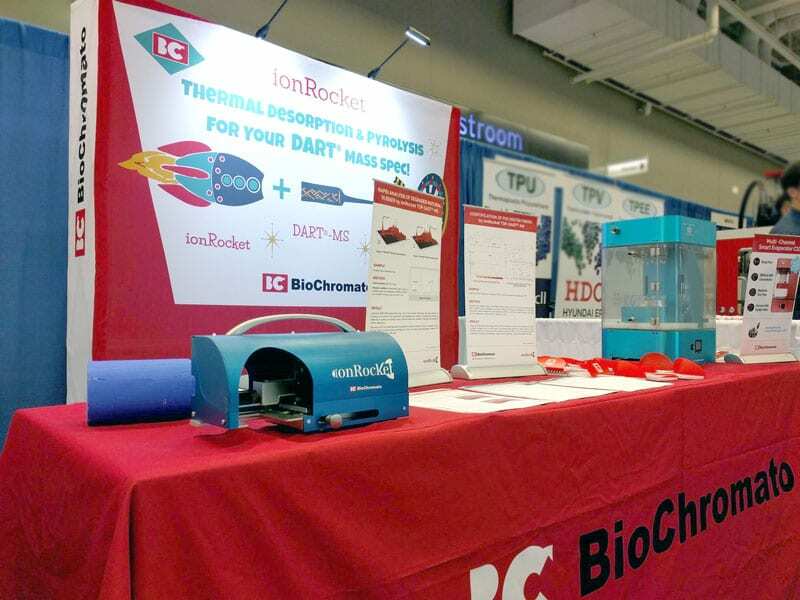 BioChromato attended the international Elastomer Conference where the ionRocket and other analytical devices were on display in the exhibit hall. In addition, we presented an oral presentation at the technical meeting section and received a lot of questions about the ionRocket from the audience. We met with many different people in the rubber and polymer industry from chemists to corporate management. Attendees were impressed with the ionRocket’s applications, especially offering quick way of directly analyzing polymers for QC/QA purposes. BioChromato was at ASMS 2017 in Indianapolis, with scientists presenting four posters on polymer and drug analysis via ionRocket (TDP/DART®-MS). 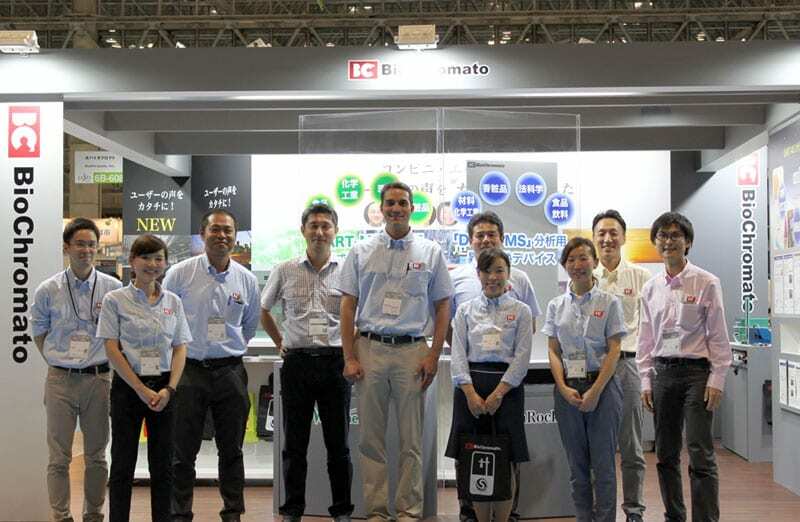 Thank you to all who stopped by our booth and posters to learn more about ionRocket: Thermal Desorption/Pyrolysis for DART®-MS and Volatimeship: volatile analysis in real time for DART®-MS.
BioChromato was at JASIS 2016 in Japan this past September 7th through the 9th. We had a seminar presentation on the Introduction of the rapid analysis technique of polymer materials by using our products for DART®-MS (ionRocket and Volatimeship). It was a great success. Thank you to all who visited.